Say the word ‘carnival’ and three words come to mind: Rio de Janeiro. Renowned the world over, Brazil’s most hedonistic city holds the biggest, craziest and most colourful week-long carnival each year. But, look outside of this fun-filled party bubble and check out the best alternative carnivals to visit during the silly season – from Salvador’s eclectic Afro-Caribbean carnival to Paraty’s sun-soaked celebrations close to the beach. If you go to carnival once in your life, make sure it’s in Rio de Janeiro. Locals and tourists alike will tell you: this is the place to do it. It’s decadent, ostentatious, and hedonistic – with two million people hitting the streets to celebrate every day. Popular street parties known as ‘blocos’ take place in all neighbourhoods across the city. Expect homemade costumes (or lack thereof) and downing copious amounts of Skol Beats, a Brazilian alcopop, beer and cachaça. Or lose your senses at the Sambadrome Marquês de Sapucaí, where samba performances take place every night. Party until the early hours and watch spectacular parades of floats, dancers and drummers. Need a break? There’s little respite during this week-long celebration, but a day trip to Ipanema beach should do the trick. Watch out Rio, you’ve got competition. Bahía’s Salvador also likes to brandish the ‘biggest carnival in the world’ badge proudly on its chest. But you won’t get the pulsating beats of samba here. Rooted in Afro-Caribbean culture, axé is the music of Bahía – an intoxicatingly high energy fusion of African and Brazilian pop-music. Expect full-on blocos and dancing in the streets for six-days straight. You’ll hear the term ‘trio eléctricos’ being used a lot in Salvador. These are are enormous trucks equipped with booming sound systems. And you’ll know it by sight: they’re followed by thousands of carnival revellers. Once the sun sets, things are bound to get wild. The main party is at Barra, close to Salvador’s main city beach. Need a break? Explore the Old Town, with its family-friendly vibe and Afro-dancing and musical influences. Or head to the ferry port and hop on a boat to Itaparica for spectacular beaches and endless vistas of the city. The state of Pernambuco has some distinctively different carnival traditions. Both cities pride themselves on having a ‘democratic party’, meaning it’s free and open to everyone to participate. Wherever you are, you’ll never be far away from an impromptu bloco, although private parties similar to ones held in larger cities are becoming more popular. 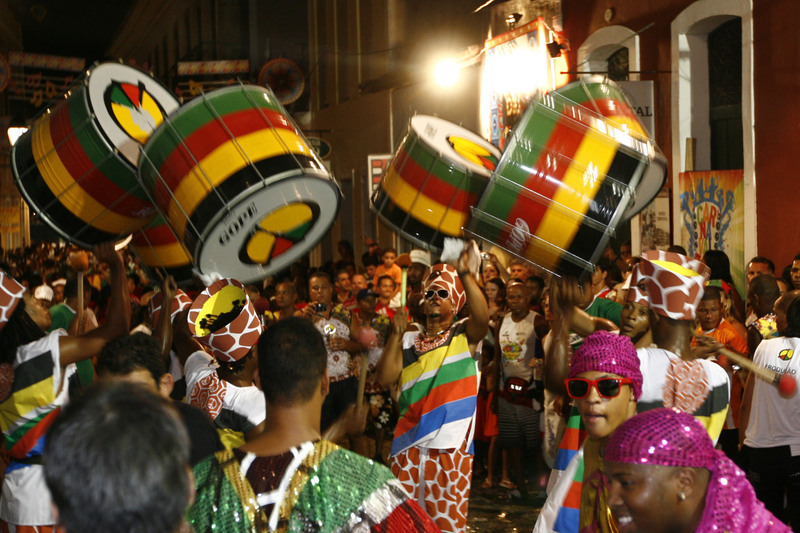 Dance fever engulfs Recife during carnival – and it’s no surprise there’s lots of frevo music. You can’t escape this genre of dance and rhythm, native in this part of Brazil. Its playful and sped-up style of marchinha originates in the area. Don’t expect to get much sleep either. A crowd of two million people gathers to party its way along the two and a half mile route around the city’s centre, continuing well into the early hours. Steeped in Afro-Brazilian heritage, one of the most touching moments of the carnival is Night of the Silent Drums, which pays tribute to African slaves who lost their lives in prison. Five miles outside Recife’s booming metropolis lies the historic city of Olinda, whose colourful and winding streets are jam-packed during carnival. Its iconic celebration is well known for the life-size puppets paraded around the vibrantly decorated streets, to the beat of frevo. It’s a great family occasion too – with children, parents and grandparents all coming together in celebration. Need a break? Take a 2-hour bus ride out of the city to Porto de Galinhas, arguably one of Brazil’s most beautiful beaches. Hop on a motor taxi and spend the day at Maracapie, where the river meets the sea. Natal’s carnival is perfect for those who love to party but are otherwise engaged for the usual 40-days-before-lent date. Held in the early weeks of December, the vibe is reminiscent of Salvador’s trios elétricocs with many a bloco to attend. This is most definitely the wildest out-of-season carnival in Brazil. Need a break? If all that partying has gone to your head, head to one of Brazil’s most famous beaches. Once a sleepy fisherman’s village, Praia de Pipa has transformed into one of the hippest beach towns in Brazil best-loved for its surfing and ecological vibe. Situated on Brazil’s lusciously green Costa Verde, the pretty colonial town of Paraty with its preserved 18th century architecture and secluded bays is transformed into a carnival of colour. Hundreds of young revellers dance through the cobbled streets as the beautiful procession takes place. Need a break? If it all gets a bit too much, take a short ferry ride to Isla Grande. The palm-lined beaches and clear waters are bound to be the perfect hangover cure. But just don’t be surprised that you’re not the only one with this idea. Unlike Rio de Janeiro and Salvador, São Paulo’s carnival tradition only began in the 1970s. Once upon a time, the teeming metropolis of Sãu Paulo was known as ‘samba’s grave’ and it was commonplace to see hoards of Brazilians flee the city at the beginning of carnival. However, São Paulo’s work-hard, play-harder culture has rubbed off on its carnival, earning a reputation as one of the country’s best. Hard-time party animals can visit the Sambodromo do Anhembi, or one of the many blocos happening in this super city. Need a break? Take a stroll around Ibirapuera Park, the city’s largest green space. Comprising of 158 hectares, you’re bound to find some solace here.